The benefits of organic eggs may be worth the extra cost. They come from chickens that were given 100 percent organic feed, free of any agricultural chemical residues. The chickens are also treated humanely, with access to outdoor space to roam. In addition, the eggs themselves contain essential amino acids, vitamins and minerals needed to keep you healthy. For eggs to be labeled as organic, they must meet requirements drawn up and enforced by the U.S. Department of Agriculture. The feed given to the chickens cannot come from crops that are genetically modified, treated with pesticides or herbicides, or fertilized with chemical or synthetic products. The chickens also cannot be treated with hormones, antibiotics or other pharmaceuticals. The U.S. Environmental Protection Agency notes that some of the pesticides used in food production may cause cancer, skin irritations, nervous system disruption or hormonal imbalance in humans. Organic eggs are free from any of these potentially harmful chemical residues. Organic eggs come from chickens that must have access to the outdoors year-round. This means the hens get exercise and have an opportunity to eat grasses, other plants and insects in addition their feed, which may improve the nutritional quality of the fat found in the eggs. According to Susan Allport, author of "The Queen of Fats," eggs from chickens that are free-range and eat a diet rich in omega-3 fatty-acids -- from sources such as grasses and weeds -- lay eggs that are higher in omega-3 fatty acids than chickens that are only grain-fed. Omega-3s play a critical role in brain function and growth, reduce inflammation and may prevent chronic diseases such as cancer, heart disease and arthritis. An independent study conducted by "Mother Earth News" confirms that free-ranging chickens lay eggs with two times the omega-3s, one-third of the cholesterol and one-fourth of the saturated fat as conventional eggs. According to the 2007 egg-testing project conducted by "Mother Earth News," eggs from free-range chickens contain two-thirds more vitamin A, seven times more beta-carotene and three times more vitamin E than conventional eggs. These differences likely come the diet of organic hens that free-range. Getting more vitamin A from organic eggs helps maintain your immune system and healthy skin, hair and eyes. Beta-carotene, which accounts for the dark orange color of organic egg yolks, is a precursor to vitamin A in your body. It also functions as an antioxidant, helping to prevent chronic diseases such as cancer and heart disease. Vitamin E is also an antioxidant that helps to maintain healthy red blood cells, nerve function and cell membranes. 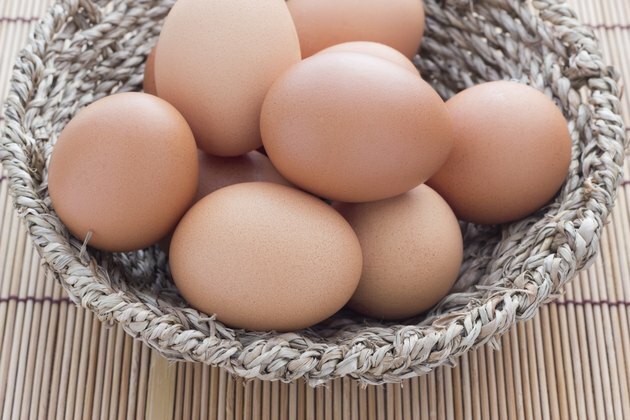 All eggs, whether organic or not, are a good source of protein, iron, riboflavin, vitamin B-12, phosphorus and selenium. From one large egg you'll get 6 grams of dietary protein. Your skin, muscles, glands and other organs require protein to remain healthy. Growth and repair of cells also relies on amino acids found in protein. Iron is essential for proper red cell production, oxygen transport and preventing anemia. The B vitamins riboflavin and B-12 aid in DNA synthesis, metabolism and maintenance of healthy red blood cells, eyes, skin, hair and nails. The mineral phosphorus is needed to maintain strong bones and teeth, while selenium is an antioxidant in the body that works with vitamin E.
Medical News Today: What Is Beta-Carotene? What Are the Benefits of Beta-Carotene? What Is the Difference Between Omega-3 Eggs and Regular Layer Eggs?